Lock in a great price for Family Lorenz & Coffee House – rated 9.2 by recent guests! Kim, the man who works there was so kind and so helpfull. He's always there to help or give and advice but not overwhelming. Nice location in a more residential area than the hotels around Old Town, but with easy tram connections straight into town. The staff is wonderfully helpful and friendly! They even helped me out with cheaper transit tickets than the pass available at the station. Felt safe coming and going at all hours (solo female traveler). Good wifi, hair dryer in room, no fan. To clear up some confusion from earlier reviews: there are pastries and cake you can purchase for breakfast in the attached coffee shop, but it isn't open on the weekends. Note that if you're arriving at a time when the coffee shop isn't open, you may need to call to be let in. So communicate with them beforehand if you won't have a phone available! Staff was friendly and accommodating. Coffee house ws very nice. Good location, au from tourists, but easy to get everywhere. The hosts: Tobi is a charm and Kim is also the most generous host I’ve ever met. He does everything he can to help out all sorts of things. The restaurants he recommends are all very nice. Also the garden is definitely the highlight of this trip. Sitting in the garden, sipping coffee, eating Chuntney vegan burger: heaven. The beds were comfortable. The suite was spacious. The staff was attentive and responsive. The transit passes were a nice touch. Comfortable, spacious, and modern room. In a safe location directly on one one the main tram routes. Great for a solo female traveler. Managed by a lovely family. Nice location to public transit. In the studio it was good for one person. I booked it for the location and being unique. The bonus was the coffee bar in front of the B&B, just a delight! even being in a broader Prague centre you feel like staying in countryside. The house perfectly isolates from all chaos of a big city. The public transport stop is literally sticked on the house and you will easily reach your room in the late night hours. I have to praise our host who always tried to find a mutual good solutions in situations like earlier check-in or ordered and missed breakfast. Definitely to recommend. Family Lorenz & Coffee House This rating is a reflection of how the property compares to the industry standard when it comes to price, facilities and services available. It's based on a self-evaluation by the property. Use this rating to help choose your stay! One of our best sellers in Prague! Family Lorenz & Coffee House is centrally located in Prague’s Vinohrady District, only a 5-minute walk from Havlíčkovy Sady Park. It offers rustic-style accommodations and free Wi-Fi access. 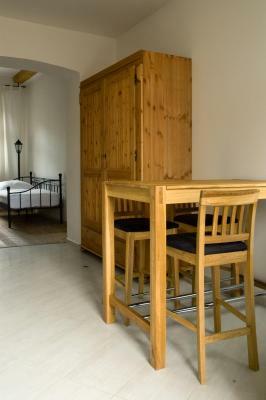 All rooms are cozy decorated with hardwood floors and have seating facilities. Their private bathrooms come with a shower. 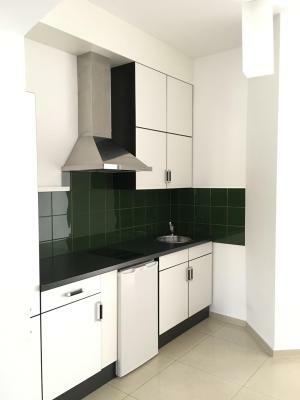 Some units feature a dining area and a kitchenette. The càfe-bar serves aromatic coffee from high-quality beans. There is also a terrace with seating area, opening to the garden. 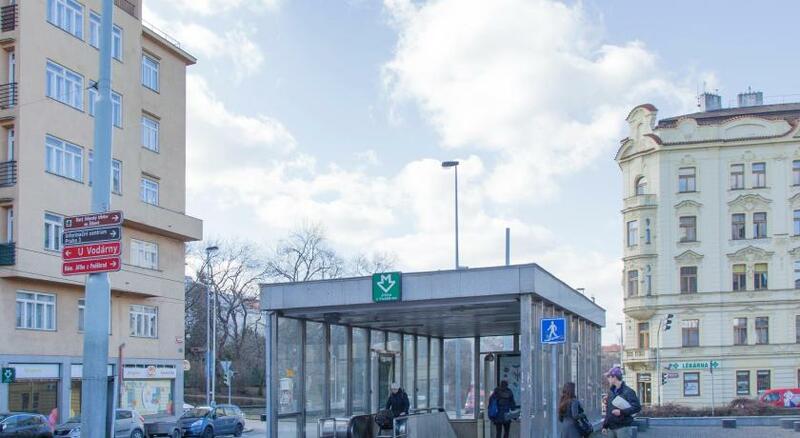 Krymská Tram Stop (Tram 22) is right outside the premises, while Náměstí Míru Metro Station is a 12-minute walk away. 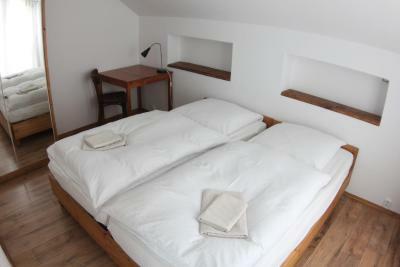 When would you like to stay at Family Lorenz & Coffee House? 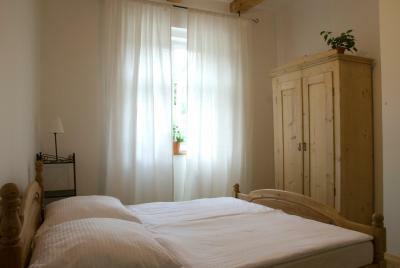 With rustic décor and wood furnishings, this room comes with a private bathroom with shower. Please note that the room rate is based on 2 guests. Maximum occupancy is 4 guests (see Property Policies). Facing the courtyard, these quiet rooms have free Wi-Fi and rustic décor. 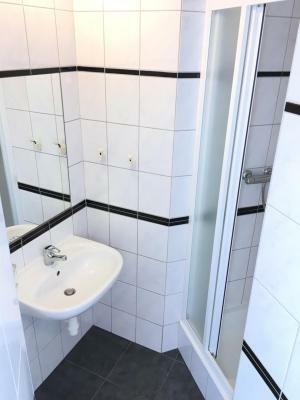 Room with wooden floors, a seating area and a bathroom with a shower. Area Info – This neighborhood is a great choice for travelers interested in monuments, sightseeing and old-town exploration – Check location Excellent location – show map Guests loved walking around the neighborhood! House Rules Family Lorenz & Coffee House takes special requests – add in the next step! Family Lorenz &amp; Coffee House accepts these cards and reserves the right to temporarily hold an amount prior to arrival. Family Lorenz & Coffee House accepts these cards and reserves the right to temporarily hold an amount prior to arrival. Please let the property know of your expected arrival time in advance. If arriving outside the front desk hours, please contact the Family Lorenz & Coffee House via telephone. Contact details are stated in the booking confirmation. Please inform Family Lorenz & Coffee House of your expected arrival time in advance. You can use the Special Requests box when booking, or contact the property directly using the contact details in your confirmation. No TV in a room, no reception desk. Very good localization, walking distance to the city center. 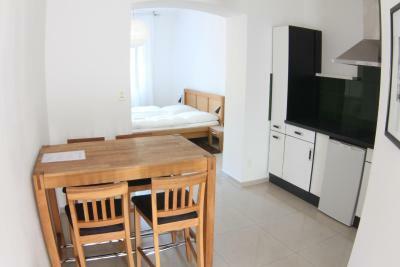 Clean room, kind host, city parking close to the hotel. Beautiful and comfortable place in Prague! Had a great stay and got a lot of help from Kim who kindly recommended places and offered his help. Would definitely come back! This place was AMAZING!! My cousin and I arrived early on Sunday morning to Prague and the city was a bit sleepy. We decided to head straight here to drop our bags, and were greeted immediately at the door. Kim checked us in and let us store our bags while we went out for the day. He was very attentive to anything we needed and the room was beautiful and comfortable. The courtyard where you walk in is just lovely and the coffee is incredible! Also, definitely try some of their pastries--they're delicious. It was a great stay and I would recommend it to anyone travelling to Prague! 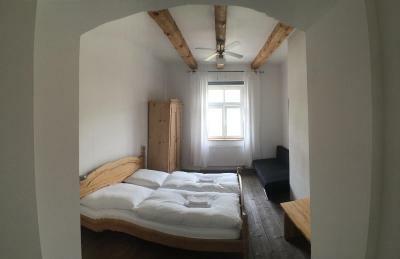 Beautiful apartment in a quiet area of Prague, very friendly host and lovely coffee and breakfast place on the ground floor. 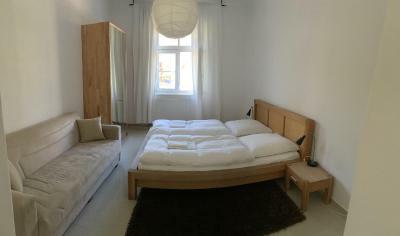 The apartment was spacious and well designed, very clean - lovely! The only thing would have been a kettle in the room - but I suspected there wouldn't be one so I took my own travel kettle with me (and a mug, and tea bags). The room was clean, quiet and comfortable. Shower water temperature control was excellent. The owner was very helpful about my late arrival and even provided directions for public transport form the airport to the property. 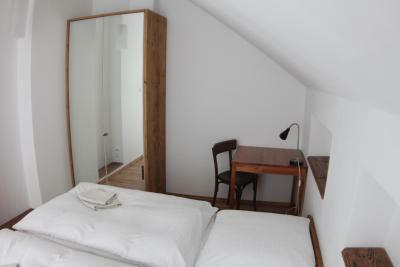 Cozy and tidy room with small kitchen in the earth of Prague 10. The neighborhood is young and vibrant, and with the tram 22 the city centre is easily at reach. The host Kim is very friendly and allowed us a late check-in and early check-out without any problem. There was a lot of street noise, which was annoying, but expected. It would have been nice to have a microwave. Comfy beds. Super clean room. Beautiful space. Helpful and unobtrusive staff. The double room specifically is quite small, more like a simple bedroom without much space to move around or places to put things. The onsite coffee house has a nice courtyard seating area, but is not open on the weekends so we didn't get to try it out. Management was very friendly and genuinely interested in our comfort. There were a couple of extra requests we had that were quickly and pleasantly taken care of. The bed was comfortable and the wifi signal excellent. 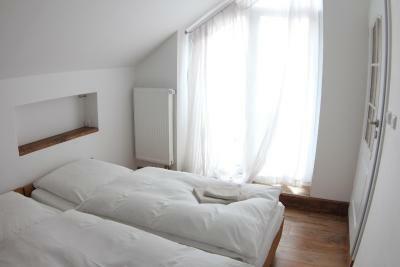 The double room is on the inner courtyard and therefore quite quiet. The rooms are really clean and the neighborood is quiet. You can reach the city center through different trams and the stop is in front of the structure. Kim is a great host! The only small pity that I can think of is that their coffee place downstairs is not open in the weekend.. otherwise no complaints! Great place. The communication with the property owners was excellent - they answered super fast via WhatsApp, and even arranged one of us to do a (very!) early check in. The family was very accommodating (looked up and recommended a great bakery in the neighbourhood) and friendly and even let us have a later check out as one of us wasn't feeling well. Laundry came back quick, place was nice and clean, kitchen well equipped. The coffee garden downstairs is absolutely lovely; you just want to sit there half the day in the sun between the plants and drink gallons of their excellent coffee. Try their almond croissant! The neighbourhood has become very hip (but not in an annoying way) and has all kinds of nice bars, cafe's, restaurants, terraces and shops, scattered all over. The parks in the surrounding are lovely to visit. The tramstop is 50m away and will take you into the centre in 10mins, so great location. This was my 2nd time at Lorenz and will definitely come back! Another review complained about the noise of the trams; I slept with my windows open and they didn't bother me a bit. What did bother me was noise from other guests/coffee shop patrons in the courtyard area. If you're also bothered by "people noise," bring earplugs. 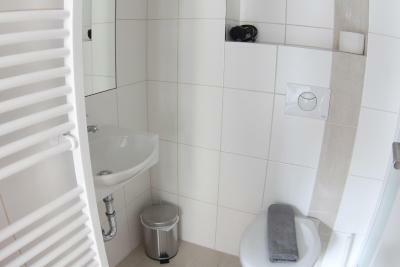 I stayed in one of the apartments and loved how clean and spacious the room was. 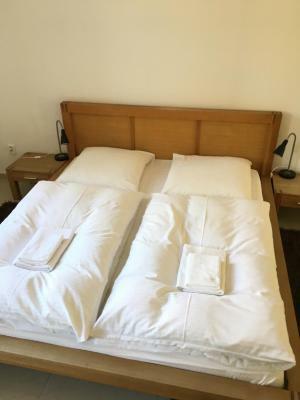 Having ocd with cleanliness that was really important to me because booking accommodation can often be stressful because of this, but I trusted the reviews and I didn’t need to worry at all because it was spotless, probably cleaner than my home in fact! The staff were so welcoming and helpful, and do everything they can to make your stay easy and comfortable. Great location with the tram stop to most places you’d want to see right outside and Vinohrady itself is just beautiful. As a woman traveling alone it was important to feel safe, and I often walked back along this street at night and felt completely safe. I would highly recommend this accommodation for cleanliness, friendly staff and location. I didn’t unfortunately get time to try the coffee shop because I was there on business and out all day, but I heard very good things about it and I will definitely look to book again when I’m next in Prague. Only drawback if you book a single try not to be the one on ground level by the coffee shop is a little noisy first thing. I would not let this put you off it is really good accomodation just a preference. Hosts were very welcoming and the room very clean and comfortable. The 22 tram which is the main tourist tram to most attractions stops 50yds from the property and there are local cafes, shops and restaurants within 300yds.